King Juan Carlos has decided to cut his own salary by 7.1 percent to conform with the latest austerity measures announced by the Spanish government. Prince Felipe and the head of the Royal Household will also see a cut, as will other members of the Royal Family, according to various media outlets. 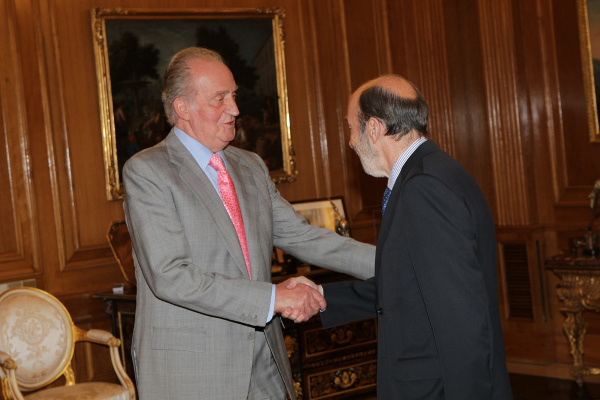 King meets with Socialist leader Alfredo Pérez Rubalcaba. Also, in a change of events, Infanta Cristina and her children will join Infanta Elena and Queen Sofia on vacation at Marivent Palace in Palma De Mallorca. Media reports have indicated that the Queen wanted the family together for at least part of the summer. Infanta Cristina’s husband, Duke of Palma Iñaki Urdangarin, who is under investigation for corruption allegations, is not expected to attend. The Royal Family has been keeping him at a distance. The Royal Household announced that King Juan Carlos will meet with Balearic officials and Prime Minister Mariano Rajoy during his own visit to Marivent Palace. Media reports also indicate that Queen Sofia will attend the opening of the London Olympics by herself. Prince Felipe will be on hand for the awards ceremony of the annual King’s Cup regatta in Mallorca. He will also preside over a meeting of foreign ministers at Almudaina Palace, also in Mallorca, to discuss the future of Europe. 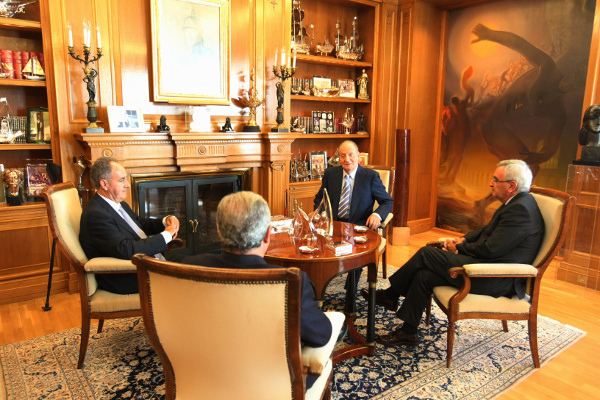 King Juan Carlos meeting with King’s Cup organizers at Zarzuela Palace last week. Tomorrow King Juan Carlos leaves for a trip to Russia. Click here for more from El Pais. Click here for more from Hola. Posted on July 18, 2012 July 18, 2012 by talkingwithamericansPosted in UncategorizedTagged Budget Cuts, Europe, King Juan Carlos, Mallorca, Prince Felipe, Spain. I’m glad that the crown adjusted their income to conform to the latest austerity measurements. At this time and age, Royalty and their riches can be a very controversial topic. Yeah, it is particularly controversial in Spain. The Royal Household there is among the cheapest, if not the cheapest, in Europe. But people still watch very closely. Thanks for reading!